Kooky can be a good thing; you just have to know how to work with it. While this 1930s Craftsman-style house in Santa Monica Canyon, California, had good bones, it had dark and had kind of a “kooky layout,” according to interior designer Amber Lewis. 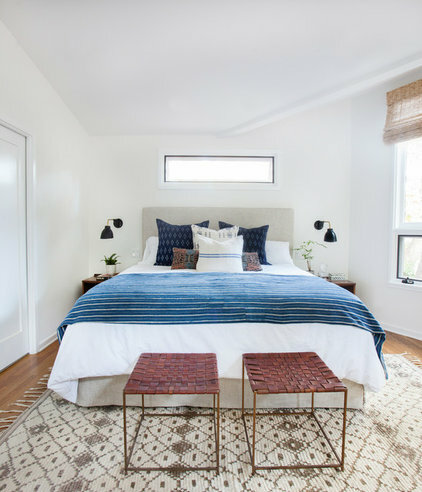 The master bedroom’s kooky features included a very long trapezoid shape and a dramatic change in ceiling height from one end to the other. The designer went to work to lighten up the room, define different zones and warm the space with layers of natural textiles from around the world. That’s interesting: Santa Monica Canyon has some unusual landscape features; a creek runs through this home’s front yard. 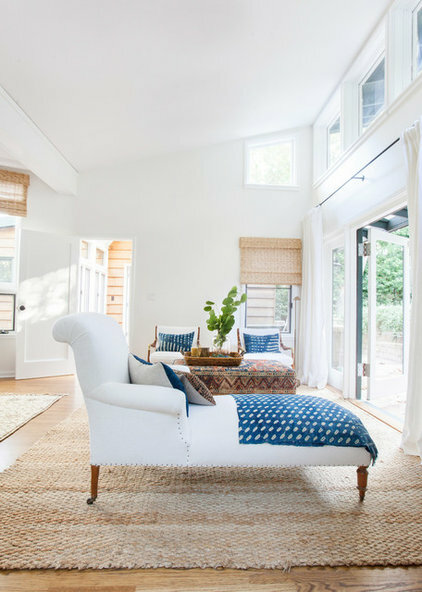 The master bedroom is spacious, but its proportions are long and narrow, and the ceiling has several different heights. Lewisused two different rugs to break up the bowling alley effect, outlining two separate areas — one for the bed and the other as a sitting area. “The room is big but feels cozy with the seating area,” the designer says. The lower ceiling in this portion of the room made it the coziest spot to place the bed. A new window over the headboard makes the room brighter. White paint is great for lighting up a room, but it can feel cold. 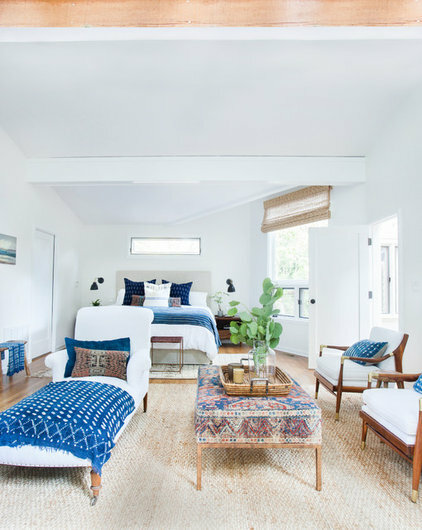 To avoid this, Lewis skillfully mixed in indigo fabrics that include Thai ikat (on the Euro pillows), a Turkish blanket, woven leather stools and a Moroccan rug. An upholstered headboard in an oatmeal hue also adds warmth. 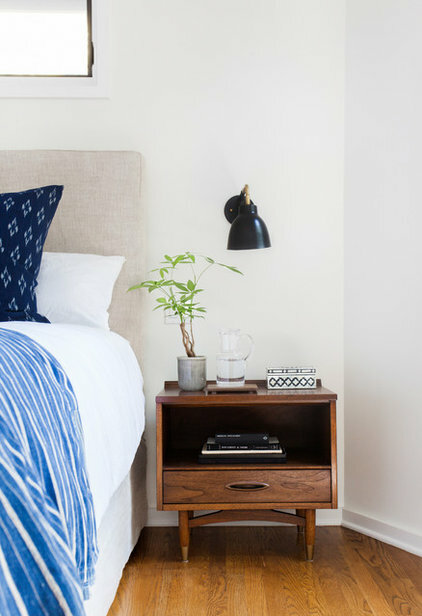 Boxy vintage midcentury modern nightstands balance atop graceful legs. Their low height helps to keep the ceiling from feeling too low. Wall-mounted reading sconces avoid the clunkiness of out-of-scale table lamps, save space and provide symmetry around the bed. 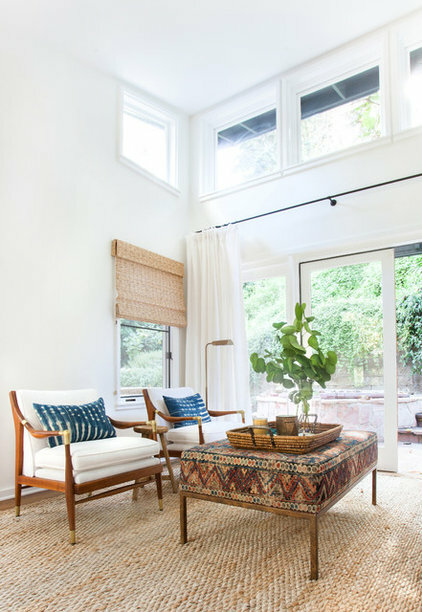 “My clients were drawn to the California eclectic thing we do. Nothing is too perfect,” Lewis says. “We use vintage fabrics, furniture and flea market finds that are unique. 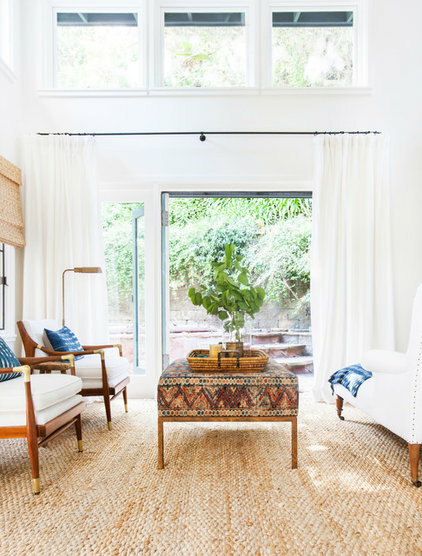 We never want a room to look like everything was picked up at once at the Pacific Design Center.” Lewis has a passion for finding one-of-a-kind pillows, rugs, blankets and other items that she sells at her shop. She also saved money buying vintage items so that she could splurge in other areas, like the master bathroom. The metal on these vintage Danish modern chairs was black when she picked them up. “After polishing them, finding the brass was a surprise and a treat,” she says. With reupholstering and some indigo pillows, they became better than new. Lewis designed a large-scale ottoman to anchor the sitting area, upholstering it with a well-worn antique rug. “It had a lot of wear and tear; I’m obsessed with the color and pattern,” she says. The ottoman’s legs are steel finished to look like patinated brass, to coordinate with the chairs. 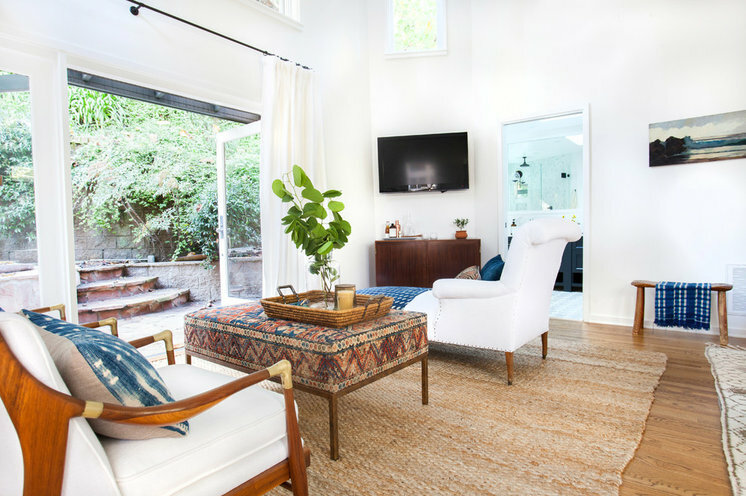 A natural-fiber rug adds to the breezy and light feeling of the room. The sitting area leads to a patio in the backyard. The furniture placement keeps the views and access completely open so that the transition from indoors to out is seamless. The chaise is the most relaxing spot for lounging, reading and enjoying the view. The piece is a French antique that Lewis had covered in washable white linen. “The house has lots of kooky charm,” she says.